This WEB Fed Bag-in-Box (BIB) Aseptic Filler is designed for aseptically filling spout-prepared aseptic bags with sterile fluids like natural juice, concentrate, vegetable juice, fruit syrup, fruit jam, magma beverage, dairy product and pharmaceutical. 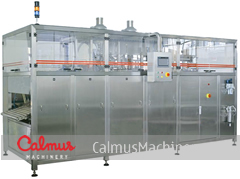 This filling system features fully-automatic by employing PLC and touch screen control system. 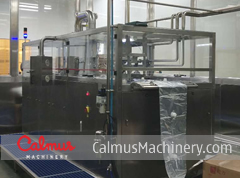 The whole process of continuous bags feeding, sterilization, decapping, filling, capping, cutting apart from continuous bags and transiting to the conveyor can be completed automatically, no human operation required. 5) Grade 304 stainless steel body and 316L stainless fluid-contact parts. 6) Employed decapping confirmation system ensures filling will not work before decapping and this guarantees the sterile room not to be polluted by the fluid. 7) Perfect-design filling system ensures reliable filling. 8) Multiple-step sterilization ensures a true aseptic filling. 9) Decapping, filling and capping parts move in an enclosed steam room which ensures the sterility. 11) Reliable and in a high standard. Most components are German branded. 12) Designed with CIP (Clean-in-Place) function and circuit connection. 13) New technology ensures no condensed water dripping onto bags. Compressed air: 6-8 bar, 1.5 m3/h.